art group in Bishkek. Image taken from Kloop.kg. Creative commons. Since their arrival in ex-Soviet Kyrgyzstan's capital Bishkek during the twilight years of Stalinism, trolleybuses have been an important and attractive part of the local cityscape. While over the years they have ceded prominence to the more manoeuvrable but widely despised marshrutka (minibus) they have retained their position as the public transport of the heart, offering residents a slower, cheaper and more pacifying ride between key points in the city of one million people. Oh, and they reduce carbon emissions, too. 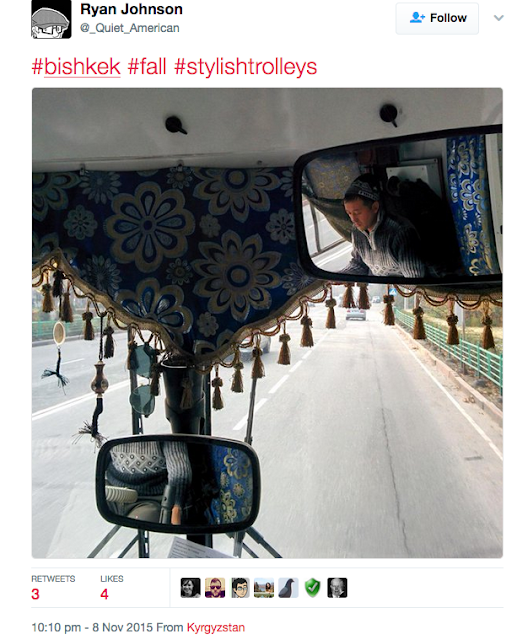 Over the last two or so years, American researcher Ryan Johnson has been providing Twitter with snapshots of life from behind the wheel of Bishkek's trolleybuses. 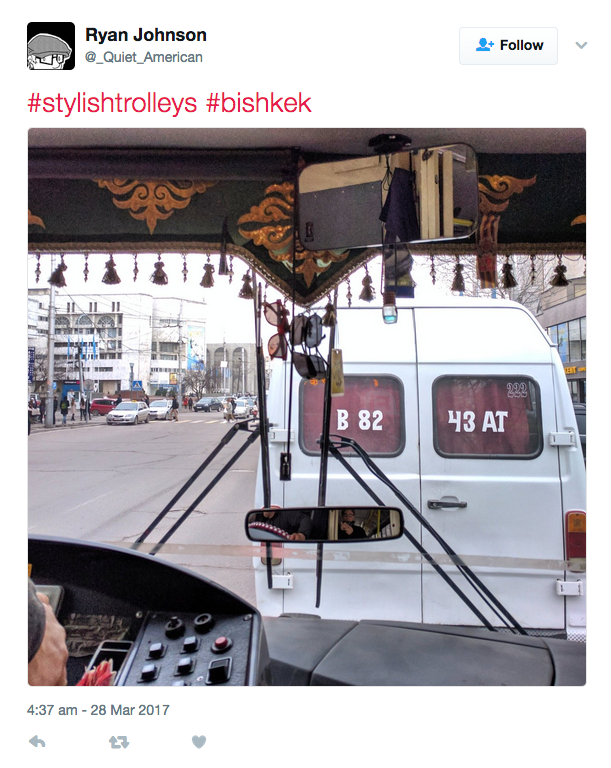 The #stylishtrolleys hashtag highlights the differing interior design preferences of a diverse spread of trolleybus drivers, while simultaneously offering a peek at Bishkek traffic through the vehicles’ cracked windshields. 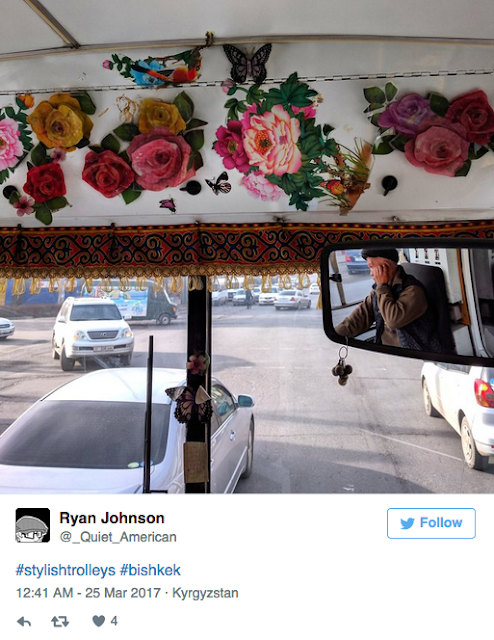 The trolleybus below, adorned with a drape featuring typical Kyrgyz nomadic patterns, is captured by Johnson looking out at public enemy No.1, the marshrutka. Kyrgyzstan is one of the few corners of the ex-communist world where minibuses are not ‘seating only’, and the resulting crush of standing bodies in the ubiquitous Mercedes Sprinter marshrutki is a source of great collective resentment. Standing is allowed on trolleybuses, but there is much more space to play with. 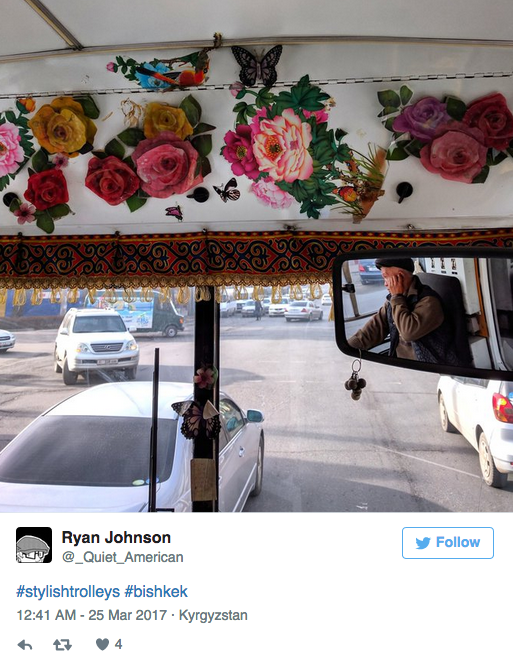 The rich blue floral pattern on the hanging framing this next trolleybus is more redolent of Kyrgyzstan's neighbour Uzbekistan, recalling the fabled Silk Road cities of Samarkand, Bukhara and Khiva. Sunglasses are kept in reserve for brighter weather. 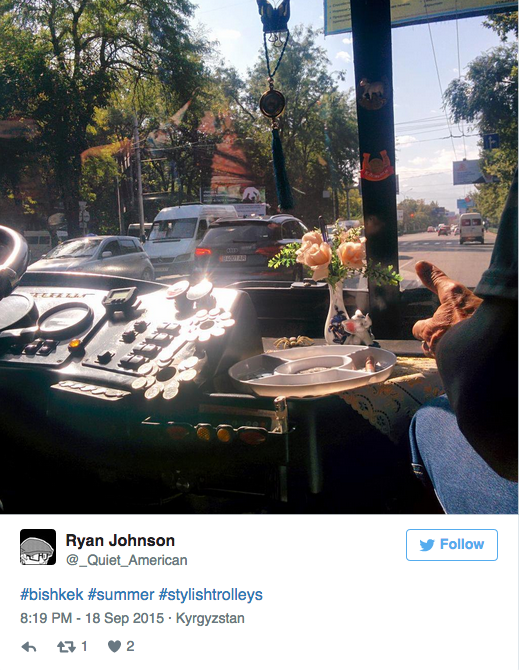 This trolleybus is big on roses and butterflies. Unfortunately driving while talking on a mobile phone is not yet taboo in Bishkek, a city where fatal road accidents are commonplace. 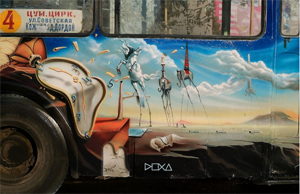 Some trolleybus drivers trust lucky charms and Islamic scripture to help them navigate their way through the city's perilous thoroughfares, but others believe in the Russian saying “деньги к деньгам”, or ‘money brings money’. 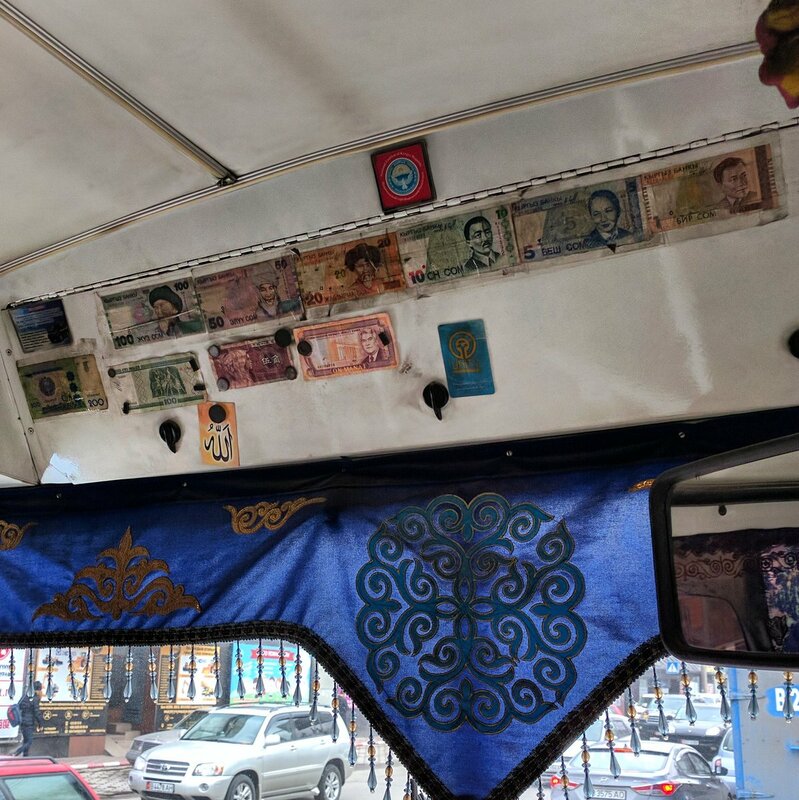 Our next trolleybus proudly displays banknotes from Kyrgyzstan, as well as one from Uzbekistan and another from Turkmenistan. This version of the Turkmen manat banknote (bottom row, furthest right), which has now gone out of circulation, bears the image of the gas-rich country's former president, Saparmurat Niyazov. 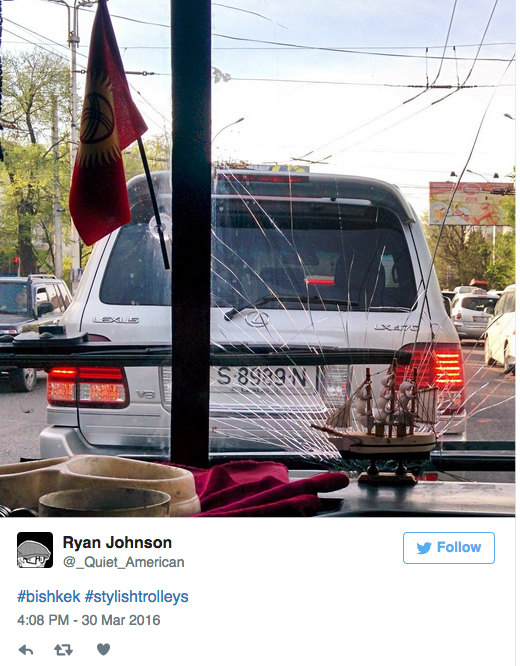 Roads in Bishkek are generally in poor condition, much to the chagrin of all drivers. Because of the poor roads, cracked windshields are almost universal. At 8 som (12 US cents), the trolleybus is more affordable than the 10 som marshrutka, and ten times as cheap as a taxi across town. Moreover, they are much better ventilated, a fact generally appreciated when the weather warms up. Sometimes, the driver makes his rounds with a friend or his wife. This, along with a random vase of fake flowers, adds to the feeling that you are a fly on the wall in someone's living room rather than a customer riding public transport. This delightful article was first published on 29 March 2017 on Global Voices Online. It was written by the Akhal-Tech Collective, a group of bloggers and journalists writing about the Central Asian region.